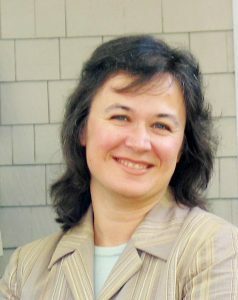 Stefka Marinova-Todd’s main research focus is on bilingual language development and second language acquisition. Currently, there are two lines in her research program. In the first line she has focused on the language and literacy development of children who are learning English as a second language (ESL-learners), and her aim is to establish the levels of language proficiency in each language of different groups of ESL-learning children (e.g., from Chinese and Filipino background). She is also interested in examining the factors that lead to a high degree of proficiency in a second language for both children and adults. In her second line of research she is interested in investigating the language and cognitive development of bilingual children, both typically-developing and children with autism. Her main goal is to establish what bilingual children can do in each one of their languages, and whether bilingual children with autism are different from monolingual children with autism. For a media interview on this topic, please click here. *Bérubé, D. & Marinova-Todd, S. H. (2013). The effect of socio-linguistic factors and English language proficiency on the development of French as a third language. International Journal of Bilingual Education and Bilingualism. [Online First], DOI: 10.1080/13670050.2013.820686. Marinova-Todd, S.H, *Siu, C., & Jenstad, L. (2011) Speech audiometry on non-native speakers of English. Canadian Journal of Speech-Language Pathology and Audiology, 35(3), 220-227. Marinova-Todd, S.H., & Uchikoshi, Y. (2010). The Role of L1 on the oral language development in English: The case of Chinese and Spanish. In A. Durgunoglu & C. Goldenberg (Eds. ), Language and Literacy Development in Bilingual Settings (p. 29-60). New York, NU: Guilford Press. Marinova-Todd, S.H. (2003). Know your Grammar: What the Knowledge of Syntax and Morphology in an L2 Reveals about the Critical Period for Second/Foreign Language Acquisition. In M.P. Garcia-Mayo & M.L. Garcia-Lecumberri (Eds. ), Age and the Acquisition of English as a Foreign Language: Theoretical Issues and Field Work (p. 59-73). Clevedon: Multilingual Matters. Marinova-Todd, S.H., Marshall, D.B., & Snow, C.E. (2000). Three Misconceptions about Age and Second Language Acquisition. TESOL Quarterly, 34, 9-34. *Ohashi, J. K., Mirenda, P., Marinova-Todd, S.H., Hambly, C., Fombonne, E., et al. (2012). Comparing early language development in monolingual- and bilingual-exposed young children with autism spectrum disorders. Research in Autism Spectrum Disorders, 6 (2), 890-897. Marinova-Todd, S.H., & Uchikoshi, Y. (June, 2013). Oral proficiency and narrative skills in the spontaneous discourse of children in kindergarten: The case of Cantonese, Spanish and Tagalog. 2013 Child Language Seminar, Manchester, UK. Marinova-Todd, S.H., & Uchikoshi, Y. (April, 2013). Transfer across Writing Systems: Reading among Cantonese-English bilinguals in Grade 2. 2013 American Educational Research Association (AERA) Annual Meeting, San Francisco, CA. Marinova-Todd, S.H. (November, 2012). The equivalent language abilities of bilingual and monolingual children with autism. Guiberson, M. (Organizer), Invited symposium on Bilingual Children with Significant Communication Disorders: From Research to Practice, 2012 American Speech, Language and Hearing Association (ASHA) convention, Atlanta, GA.
Marinova-Todd, S.H., *Bérubé, D. (July 2012). A comparison of language and reading skills in two groups of French Immersion students from Anglophone and multilingual homes. Geva, E., Genesee, F., & Savage, R. (Organizers), Invited symposium on Second Language Reading Acquisition in Diverse Contexts – Canadian Perspectives, 19th Annual Meeting of the Society for the Scientific Study of Reading (SSSR), Montreal QC. Marinova-Todd, S.H. & *Bérubé, D. (April 2012). Vocabulary and Reading Skills of Cantonese and Filipino ELLs and English Monolinguals in Canada. Uchikoshi, Y., & Marinova-Todd, S.H. (Organizers), Symposium on Words, Palabras, 詞/词: Effect of Vocabulary on Literacy of ELLs from Pre-K through Grade Two. 2012 American Educational Research Association (AERA) Annual Meeting, Vancouver, BC. Marinova-Todd, S.H., Navigating the Wonderland of bilingual children: Their language development and assessment. Knowledge Mobilization for an International Crosslinguistic Study of Children’s Speech Development, UBC, August 2013. Marinova-Todd, S.H., Multilingual children in French Immersion programmes in Canada. Department of Education, University of Oxford, UK, June 2013. Marinova-Todd, S.H., One language or more? The education and service delivery for bilingual students. BCASLPA-sponsored talk to educators and SLPs at the Abbotsford School District, Abbotsford, BC, May 2013. Marinova-Todd, S.H., “Jumpeth like[s] drinking ice”: The equivalent language abilities of bilingual and monolingual children with autism. Centre for Interdisciplinary Research and Collaboration in Autism (CIRCA), UBC, April 2012. Marinova-Todd, S.H., Dire et lire: Language proficiency and reading in multilingual children in French immersion. Second Language Acquisition Cluster at the Department of French, Hispanic and Italian Studies, UBC, February 2012. Marinova-Todd, S.H., Words, mots, 詞/词: Vocabulary skills of bilingual children. Centre for Intercultural Language Studies, UBC, Vancouver, BC. April 2011.